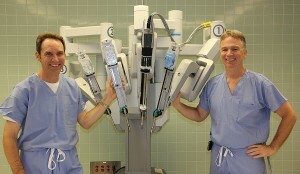 When a diagnosis of prostate cancer calls for the surgical removal of the prostate gland, patients in the Midwest have a unique and highly skilled da Vinci robotic surgery resource in the physician team of Dr. Robert Gaertner and Dr. Christopher Knoedler.These highly trained and compassionate physicians bring the da Vinci robot and the benefits of minimally invasive surgery to thousands of men facing prostate cancer. were the ﬁrst in the region to routinely use the da Vinci Robotic Surgery System and have literally led the way in using it to improve the extremely challenging surgical procedure to remove the prostate gland (Prostatectomy). continue to train physicians throughout the U.S. and abroad while patients worldwide seek them out through the referrals of physicians, former patients and friends. Dr. Gaertner and Dr. Knoedler have a combined level of urological surgical experience that exceeds 40 years. This exceptional degree of experience provides patients with the beneﬁt of having a physician team that can conﬁdently manage their individual needs together with the critical skills to operate the sophisticated da Vinci Surgical System. Of particular importance for any person facing prostate cancer surgery are the qualiﬁcations of the physician(s) performing the surgery as well the approach to which the procedure is performed. One of the most important aspects of having a prostectectomy performed by Dr. Gaertner and Dr. Knoedler is that all of their patients have both physicians in attendance for each surgical procedure. This affords every patient with their combined expertise to accommodate each patient’s needs. These physicians are unique in this team approach and their commitment to this continues to serve their patients with highly successful outcomes and minimal complications. incorporates the latest in software and surgical manipulation advances to help to assure that specimen margins (the outside areas of the excised prostate) do not have cancer cells present. is signiﬁcantly better than traditional open surgical procedures because of the high degree of accuracy they are able to obtain. For patients this is a tremendous advantage in achieving a successful outcome. helps to assure greater accuracy in not only getting specimen margins that are clear of cancer cells but helps to enhance their ability to reconstruct the surgical area while minimizing trauma or damage to critical nerve bundles or muscles. Over 4,000 men throughout the Midwest including the states of Iowa, Minnesota, N. Dakota, S. Dakota and Wisconsin and beyond have beneﬁted from the surgical pairing of Dr. Gaertner and Dr. Knoedler. International patients from Canada, Europe, the Middle East, Africa, and Asia have sought out their robotic surgery expertise. The vast majority of them now leads active, normal lives and readily acknowledges and values their access to both the da Vinci technology and their physicians’ medical skill. 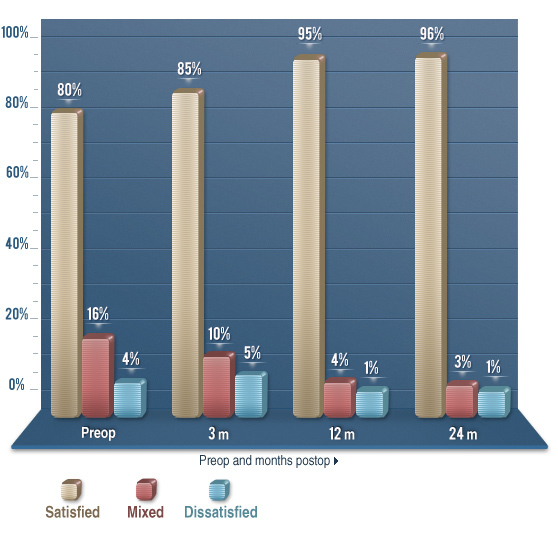 CLICK HERE to view our patient outcomes data now! Da Vinci Robotic surgery procedure for prostate cancer delivers highly successful outcomes, minimal discomfort and a rapid return to a normal lifestyle.